I do my transcription job with precision, perfectly and within least possible time.You will get the transcription done in high quality work and precisely.You decide in which format you required your document to be transcribed (word or excel or pdf format). The sound should be audible and clear that I can transcribe it perfectly. Amount of hourly required can and price will be negotiable, do contact for that. I provide with service as follows. 2) Flexible time as per the requirement. 3) Perfection will be there in the work always. 4) Quality always maintained even during the load. i need clear audio for transcription that's all ,your work will be done.please contact me before buying the hourly. I am an chemical engineer from University of Mumbai.I personally feel like my work to be completed by time and perfection and I do so. 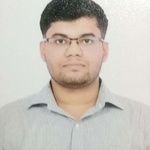 Likely I will do the assigned work with dedication...Read moreI am an chemical engineer from University of Mumbai.I personally feel like my work to be completed by time and perfection and I do so. Likely I will do the assigned work with dedication and determination in least possible time. My area o expertise is mathematics ,physics and chemical engineering.